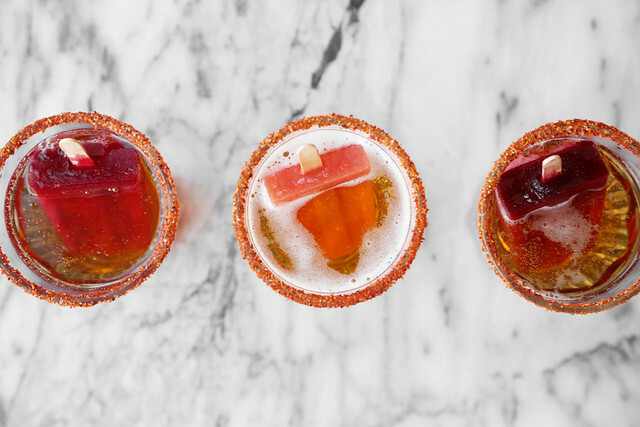 We’re making three different michelada popsicle flavors. The first one is just a classic standard tomato base. 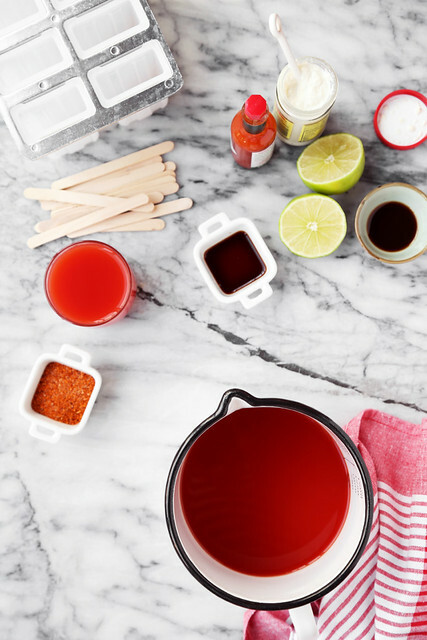 In a large mixing bowl, or glass measuring cup, whisk together the Clamato juice, tajin seasoning, Worcestershire sauce, hot sauce, lime juice, soy sauce, and horseradish. 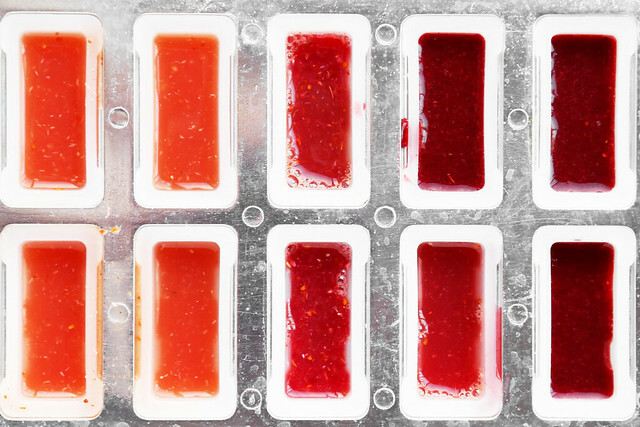 Divide the mixture into about 3 or 4 of the popsicle mold slots. For the second flavor, we’re doing a Habanero Blood Orange Michelada. 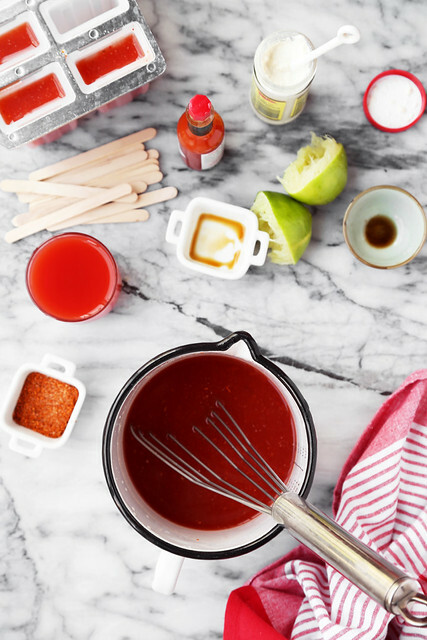 Clean out the measuring cup or bowl and whisk together the fresh blood orange juice, habanero simple syrup, Worcestershire sauce, soy sauce, tajin seasoning, horseradish and lime juice. Pour into 3 of the popsicle molds. The third and final flavor is a Jalapeño Blackberry Michelada. Once again, clean out the bowl or measuring cup and whisk together the blackberry jalapeño juice, tajin seasoning, lime juice, Worcestershire sauce, soy sauce, and horseradish. 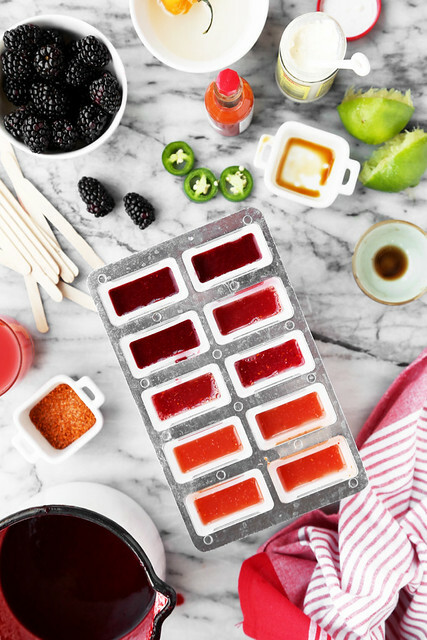 Fill the remaining popsicle molds with the blackberry mixture. You can decide how many of each to make or you can make them all one flavor to make things easier on yourself! Place the lid on and then pop in the popsicle sticks. Freeze until fully frozen, about 6 to 8 hours or overnight. 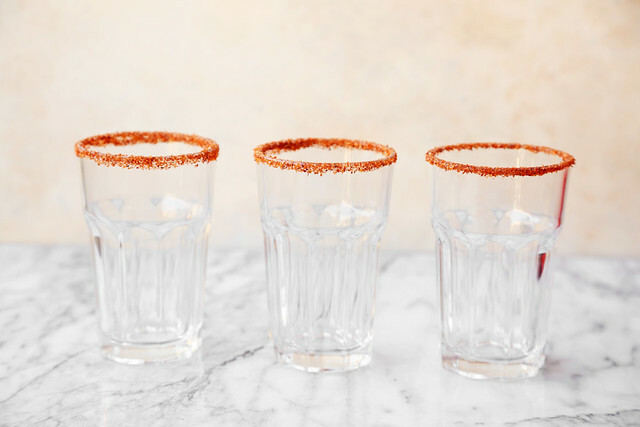 Once ready to serve, prepare your glasses by dipping the rim of each glass into lime juice and then into tajin seasoning. I mention Tajín a lot in this post and just in case you don’t have any idea what in the world I’m talking about, Tajín is a Mexican company actually but they make a spice blend of chili pepper, lime, and salt. That’s their most popular flavor. You can normally find it in the produce section or in the Hispanic foods aisle of your grocery store. If you can’t get a hold of it, just mix a bit of salt and chili pepper in a small bowl. Fill the glasses about half way (or a little more than halfway) with beer. 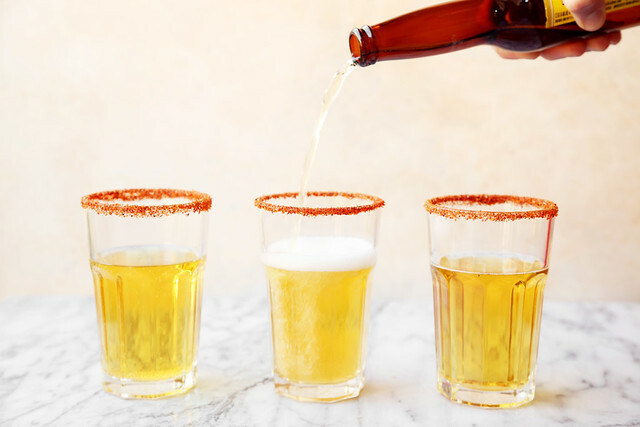 Use a light-colored Mexican beer like Corona or Pacifico for this! You don’t want to over fill the glasses with beer because when you go to put the popsicles in, they’ll overflow if there’s too much beer in the glass. Make sure the glasses and the beer is super cold right before serving. Then carefully unmold the popsicles (by running the mold under warm water for a few seconds) and then lifting them out. Dunk the popsicles (whatever flavor you like) into the cold beer. Feel free to swirl them around to start unleashing the flavor. These are great for a fancy brunch. 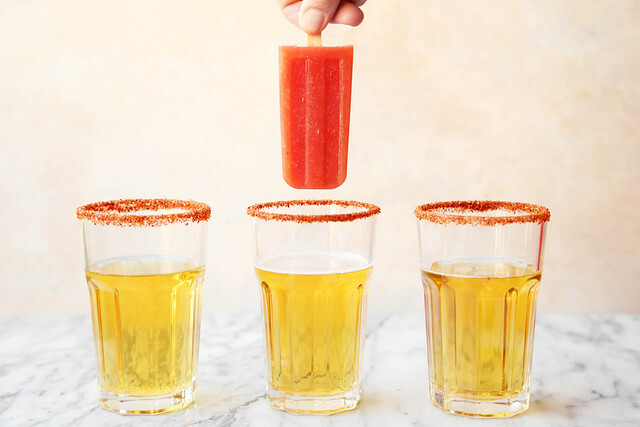 You can make up a big batch of these popsicles and just grab a bunch of beer and have people assemble their own micheladas. I love these popsicles because as they melt, they dissolve right into the beer and all you have to do is give it all a swirl so that its evenly combined. You’re not overwhelmed by the spicy tomato flavor, and you get just the right amount of kick in your beer. They also keep your beer cold without diluting it with water the way ice does once it melts. It’s perfect! 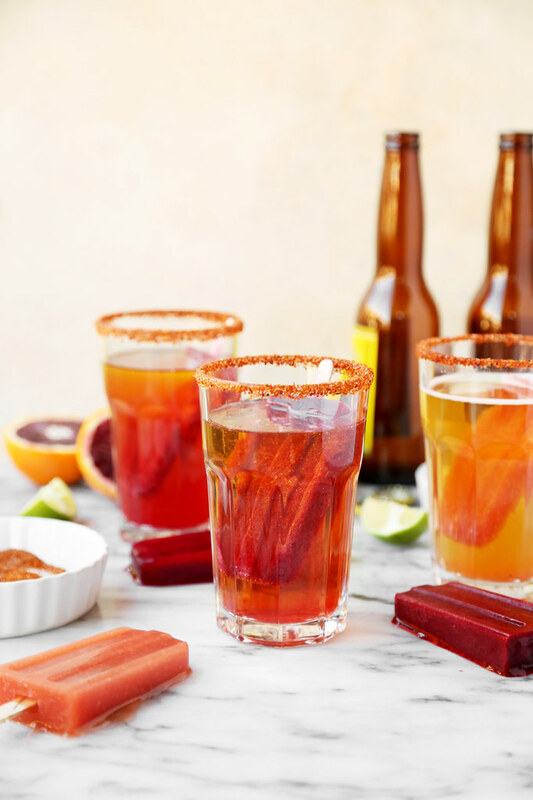 If blood oranges or blackberries aren’t in season for you, just make a batch of the classic michelada. Just triple the recipe to get the right amount for the popsicle mold. Spice up your next brunch and be the cool one on the block. 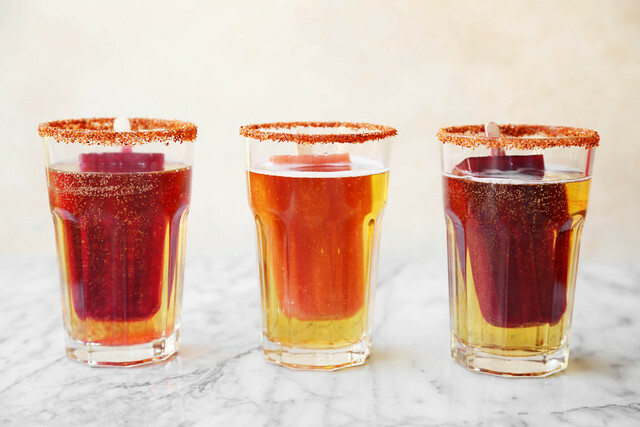 Your friends and family will love this fun new twist on a classic michelada. They’re a great way to get people excited about brunch or just morning drinking in general! 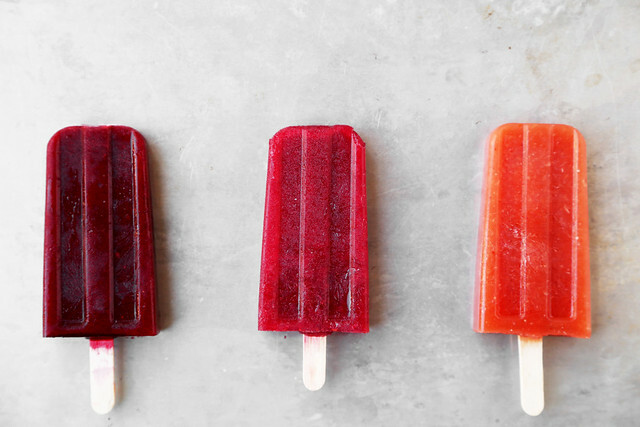 Michelada Popsicles are the perfect brunch treat. 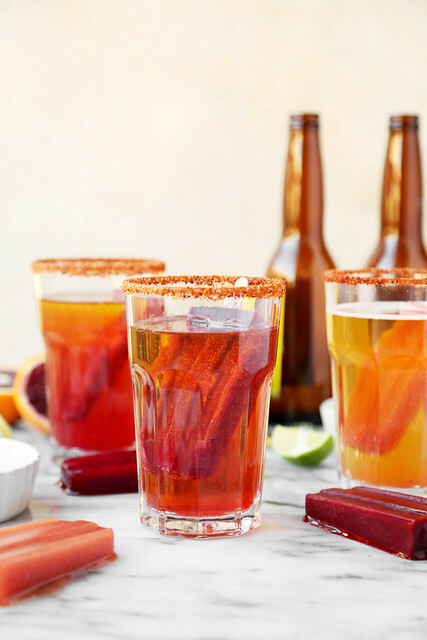 Make up a batch ahead of time and then serve the popsicles inside a tall glass of beer! 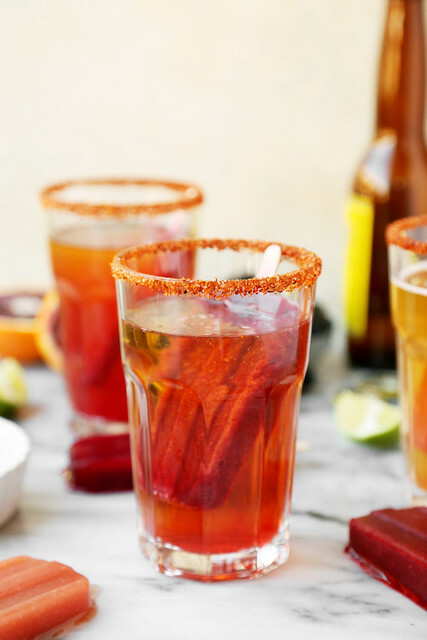 For the classic michelada popsicles, in a large bowl or glass measuring cup with a spout, whisk together all of the ingredients until smooth. Carefully pour among 3 or 4 popsicle molds. Set aside. 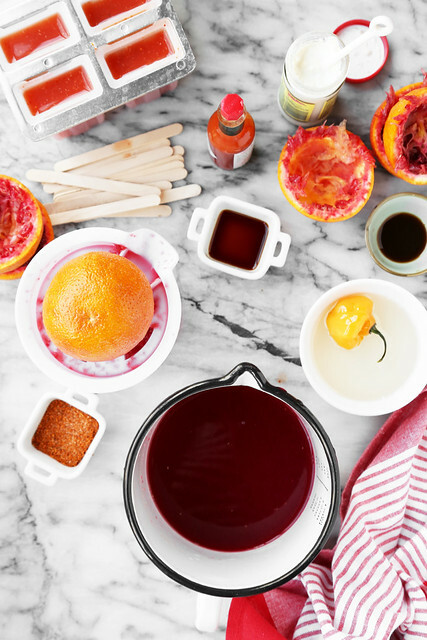 For the blood orange, combine the water, sugar and whole habanero pepper in a small sauce pan. Set over medium heat and bring to a simmer. Cook until the sugar has dissolved and the syrup has thickened, about 10 to 15 minutes. Remove from heat and let cool completely. Then whisk together the blood orange juice, half of the simple syrup, lime juice, Worcestershire sauce, soy sauce, seasoning spice, and horseradish until smooth. Pour into 3 popsicle molds. Set aside. 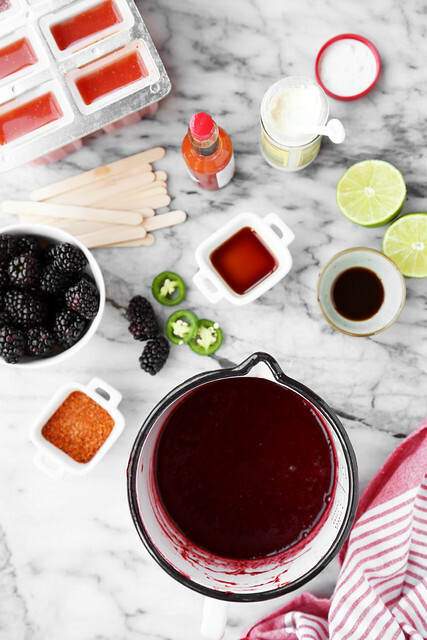 For the blackberry, combine the blackberries, jalapeño, and a splash of water n a blender. Blend until smooth. Pour the mixture into a bowl or glass measuring cup through a fine mesh sieve to remove the pulp. Whisk in the remaining ingredients and then divide among 3 or 4 popsicle molds. Place the lid on and then drop in the popsicle sticks. Place in the freezer and freeze until firm, about 6 to 8 hours or overnight. 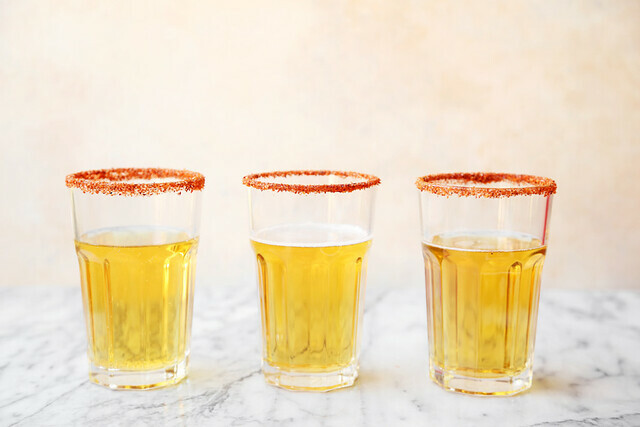 To serve, dip the rim of each glass into the lime juice and then into the Tajín seasoning. 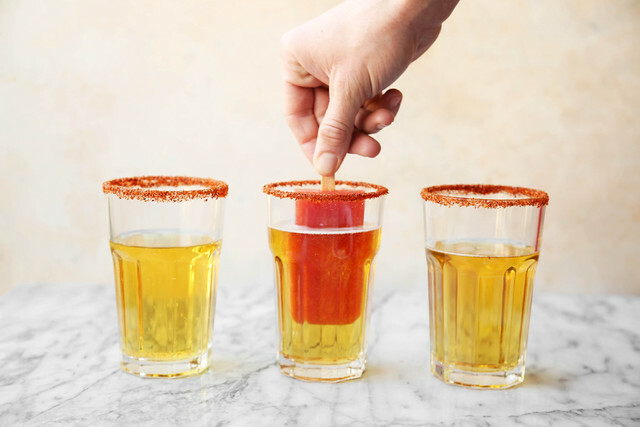 Pour the beer halfway into each of the glasses. When ready to serve, drop a popsicle into each beer glass. Serve immediately. Get out of town! Love it! Awesome! I can’t wait until summer.